We were on holiday in Great Yarmouth, my parents, myself and my two younger brothers. It was in the late 1950's. 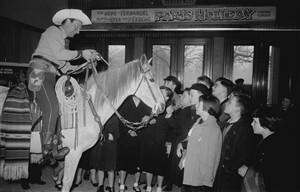 We saw a cowboy act called Cal McCord and he was outside the theatre where we were looking at him and his horse. My little brother sat on the horse with him and picture was printed in the local paper. I am writing my autobiography and the V & A Museum forwarded me some photos. It would be lovely if anyone could locate a photo of my brother from the newspaper, but what I would dearly like to know is what was the exact year he was he was at the Theatre in Great Yarmouth? This page was added by Eve Watkins on 01/06/2018.